Hydration for Athletes Starts 2 Days Before Event! 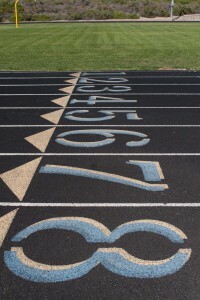 Question: My son runs track in the one-mile and two-mile events. After practice, should he drink a recovery drink? Should he drink one of those pre-workout drinks? How much water should he drink on race day? Answer: Let’s address water first. Hydration is an ongoing process. It’s not something that you can do on race day or try to get it in all at once when you realize at the end if the day you haven’t had enough to drink. It is at least a two or three day process. It’s difficult at school to continually drink water because of the frequency needed to go to the bathroom. Just get in water when you can and keep a loose count of how much you’re getting. Always drink the eight glass rule which is 64 ounces. For a 140-150 pound runner raise that to 96 ounces. As the temperature continues to climb he will need more. Two days prior to a race event, he should pay particular attention to his water consumption. Performance can erode by as much as 10% from being dehydrated by only 3%. On race day after his event, alternate an electrolyte drink with the water. When he is through with all of his events, then a protein/carbohydrate recovery drink would be helpful. After he completes his practices would be an ideal time for the same recovery drink. After training or racing the body needs readily available sources of protein and carbs for recovery and repair Whey protein is quick and easy to digest and assimilate. He will still need food soon after that. Pre-workout drinks are not recommended. For one thing, most have stimulants and are not allowed and really aren’t the best idea from a health perspective. Kids don’t need them and shouldn’t use them. Consistent nutrition and hydration are the keys to help keep a body fueled and ready to race.